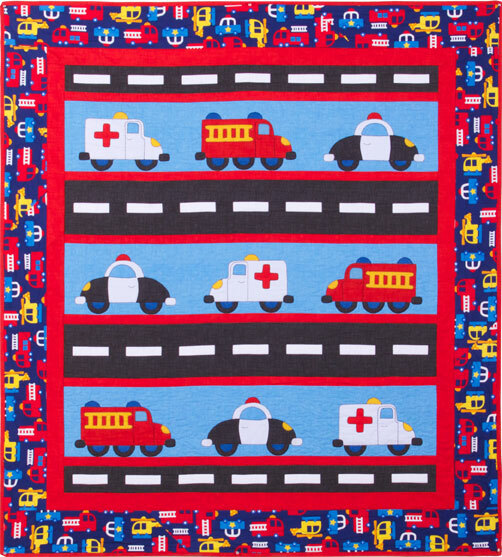 Welcome to our JUNE Block of the Month! I’m Designer/Radio show host Pat Sloan! 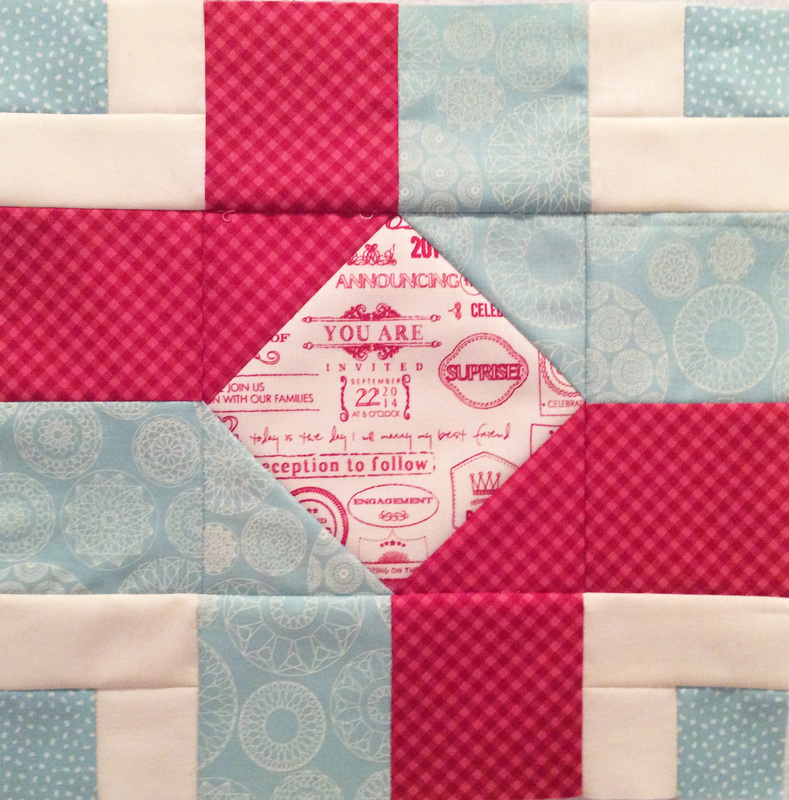 The theme for the Aurifil Designer blocks is a ‘woman who has given you inspiration’, our June designer has a wonderful story about her block that I bet a LOT of you will relate to. 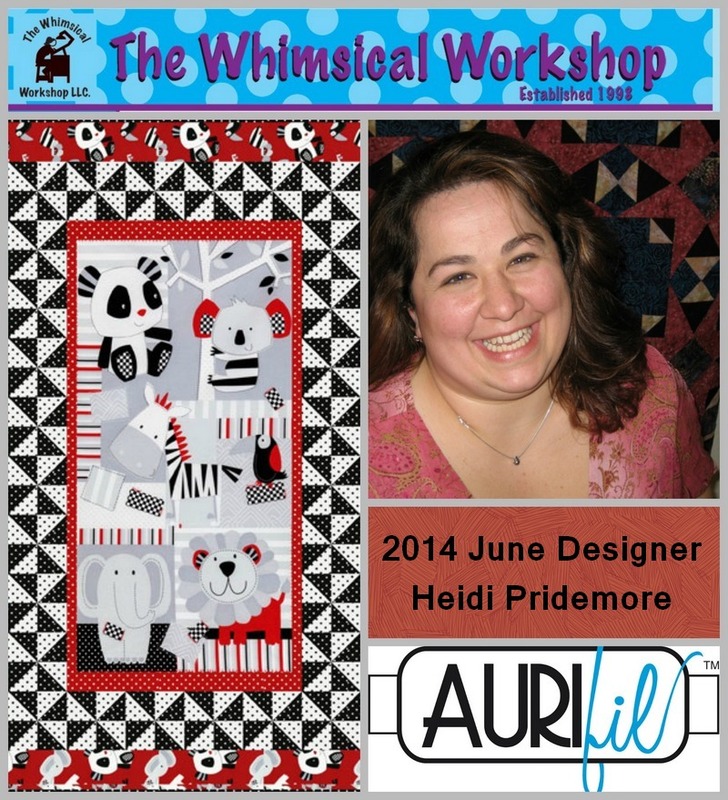 Heidi Pridemore from The Whimsical Workshop joins us as our June Designer. She lives in Chandler, AZ. 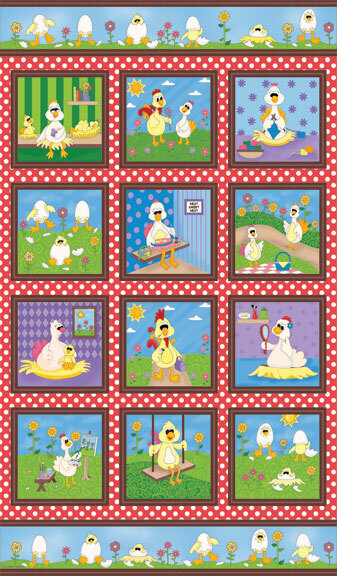 Once you visit Heidi’s site you will immediately recognize quilt after quilt you have seen in magazines and at your favorite fabric sites… she is a design machine! 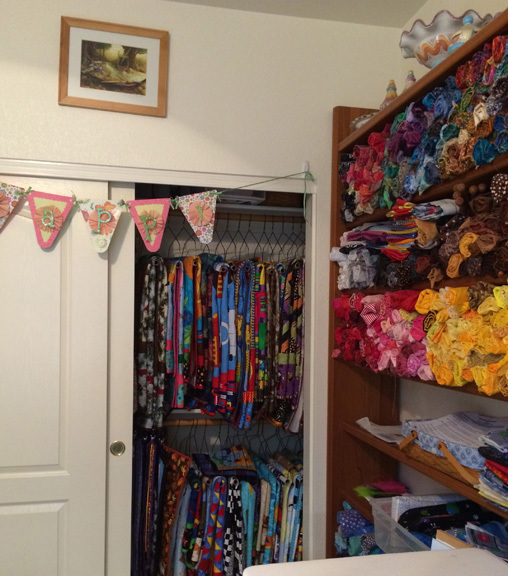 She also designs fabric, travels, teaches and has used Aurifil thread for many years. 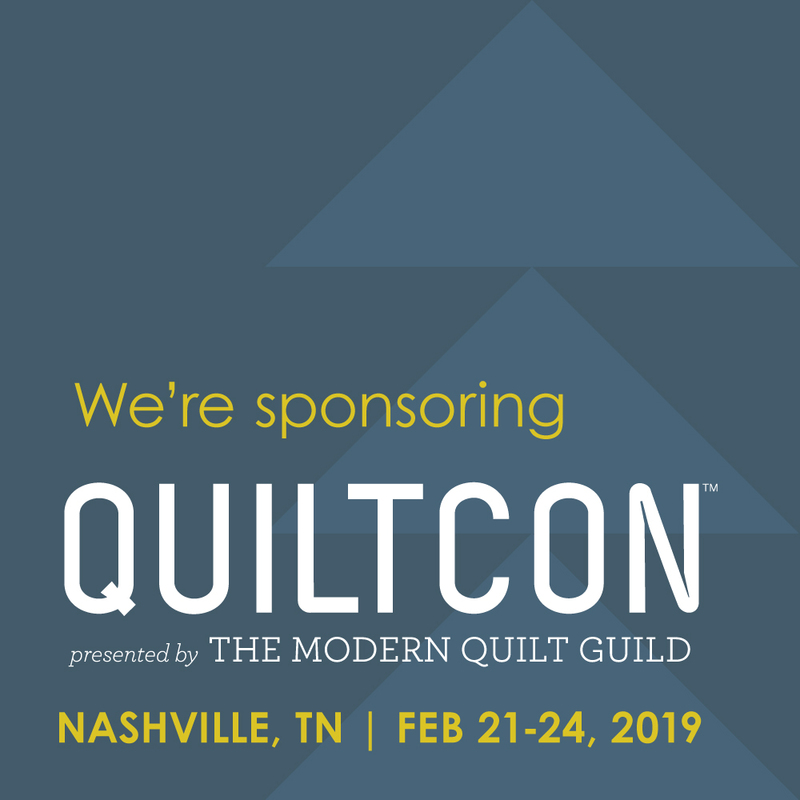 We continue our MONTHLY thread BOX giveaway (seriously folks… you could win a box of my thread which is over $120.00 value.. for making a quilt block… you have to join in!). 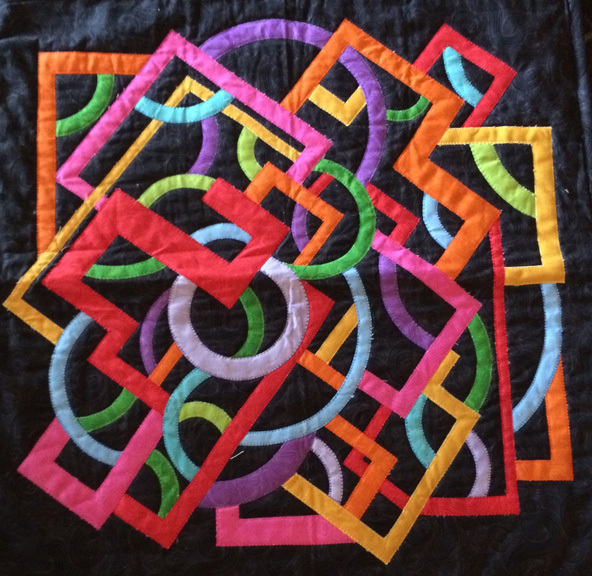 The first quilt I saw was one my Husband’s Grandmother had made for him when he was young. She hand pieced and hand quilted it. 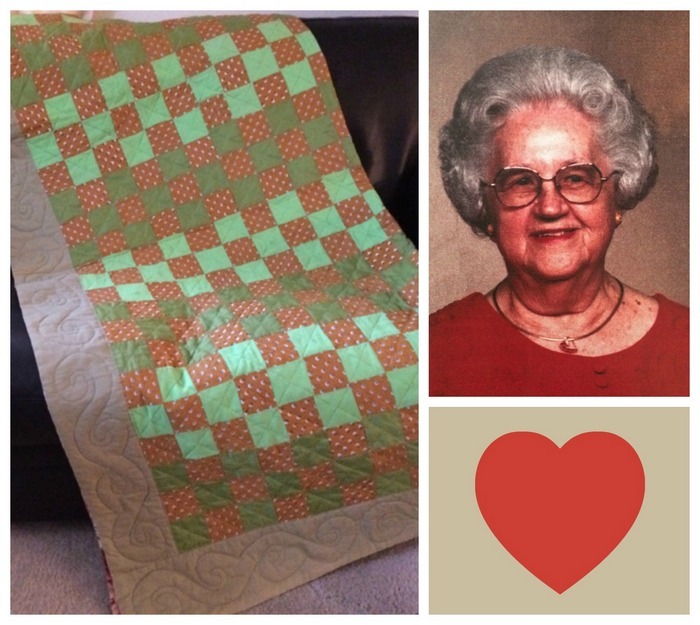 She was a great lady who really inspired me to start quilting. 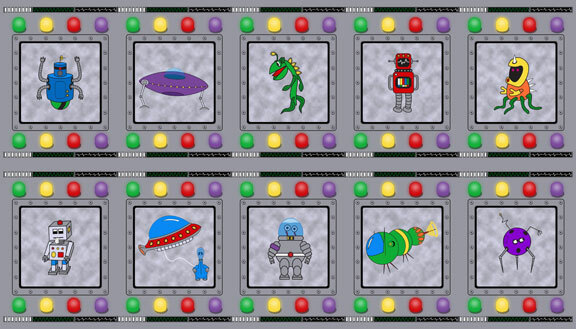 Do you still have your first project you ever made? 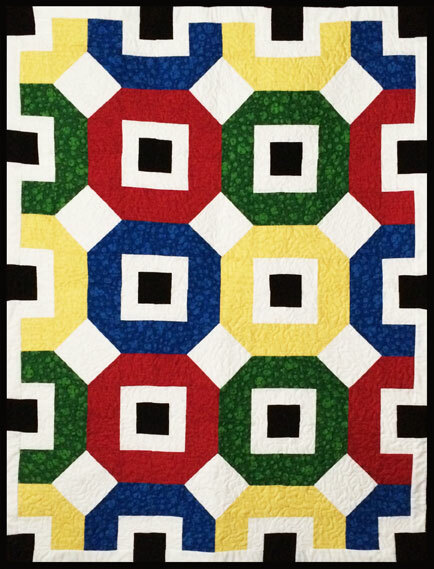 I am drawn to quilts that have a strong color combinations. I like the fact that you can take a simple pattern or design and really make it pop with a good use of color. 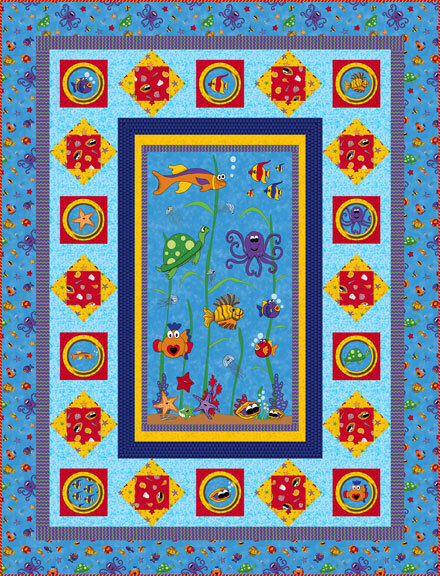 I also love applique quilts because each one has unique images from the designer. We all have parts of the process we ‘prefer’ more than others. 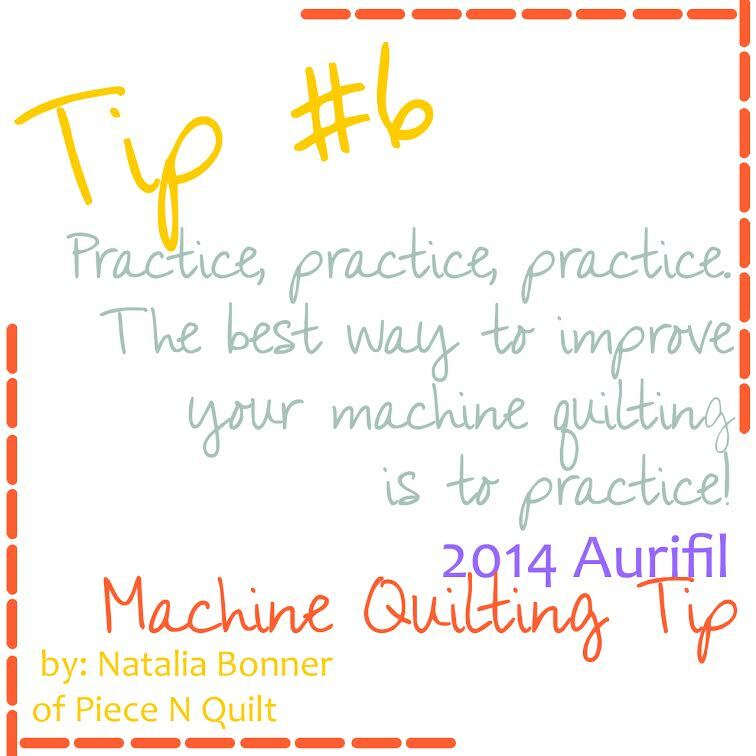 What part of quilt making do you ‘Prefer’ most and why? And which the least. and why? 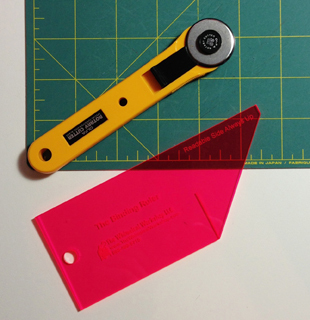 I have a degree in Industrial Design and my first job out of college was for a company that manufactured craft kits for the retail market. 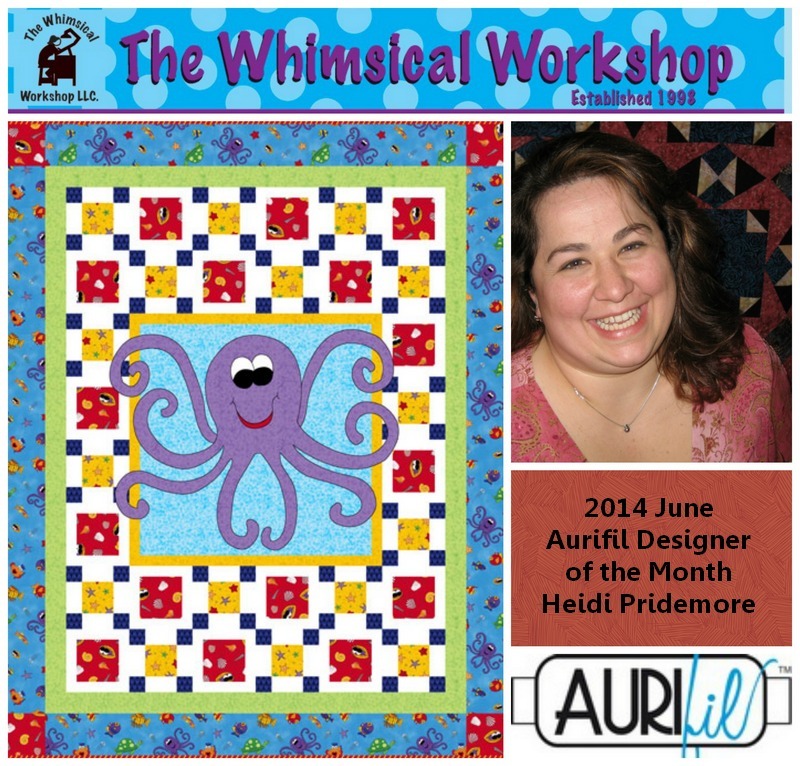 In 2000 I started The Whimsical Workshop. I was 28 years old and did not really think about how hard starting my own business would be So I dove in and just started. I am very lucky to have been doing what I love for 14 years and to have great support from my family. In 2010 my husband Matthew joined the company full-time so now I get to do what I love with the man I love everyday. Oh so many to choose from. I mostly use the lovely neutrals with Light Gray 1100 being my favorite. 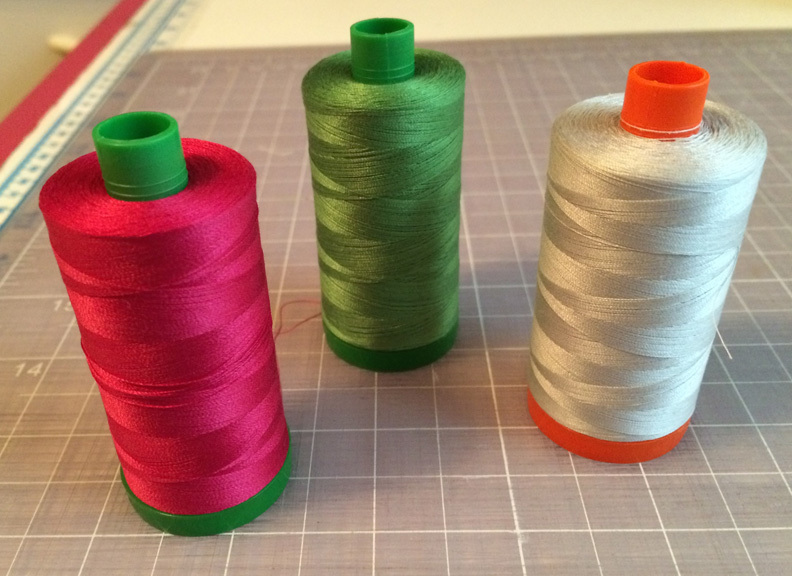 I also LOVE Aurifil invisible thread. For my favorite colors of the day are 2884 and 2600. Currently I work in our library as my studio. 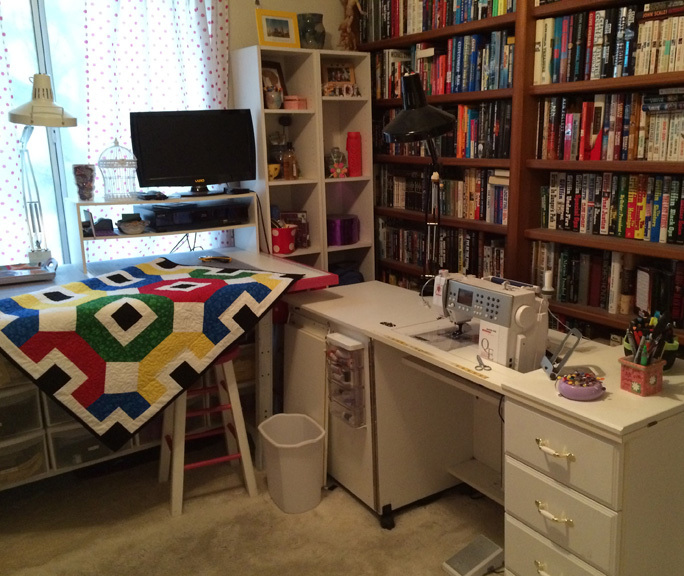 It is a pretty small room without any wall space to use for a design wall. I moved into this small space from a much larger studio so this took some getting use to. This is a temporary space for me but it has taught me how to work without extra space. First I would love to have my design wall back. And Second I would like to have plain walls I can paint any color I like and more storage would be good too! If you could follow one person for a day.. who would it be? 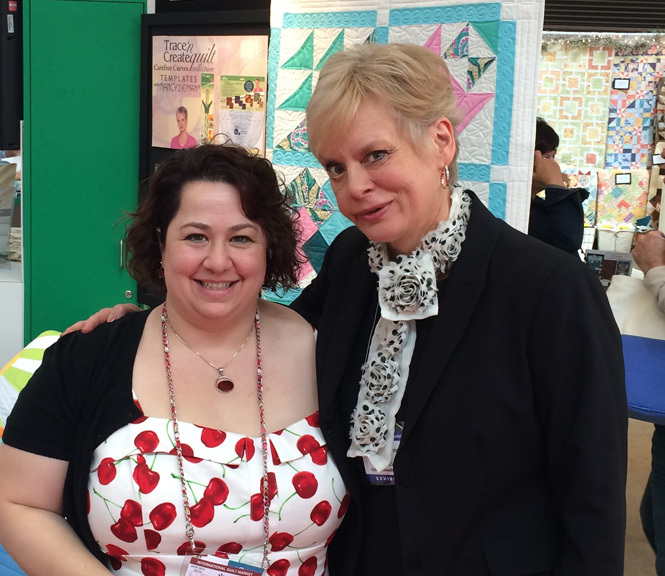 Nancy Zieman. I was lucky enough to spend a day with her in 2009 while working on my Fabric Jewelry book. She is an amazing person with a wealth of knowledge in so many areas. She is also one of the nicest people I have ever met. and my Husband has a line out with Quilting Treasures “Mission-Space”. I am so proud of both our lines. It is so exciting to see our designs in print. I have so many amazing women in my life that have inspired, encouraged and supported me throughout my career! But this block represents my sisters and as the middle child I could never choose between the two. They have been my support throughout my life and always there for me. They are my bookends in life always supporting me. They inspired this block, my little sister, Echelle is a woman of great inner strength. I am always amazed at how she deals with life. I love to visit with her and her furry family. She is represented by the light blue rings on my block. 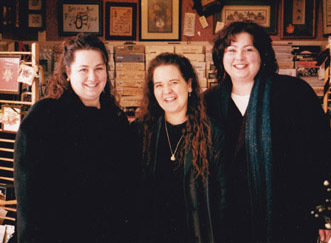 My older sister, Stacey has always looked out for us and been the trailblazer through life for her two younger sisters. I have always followed her lead and have shared a passion with her for creating. 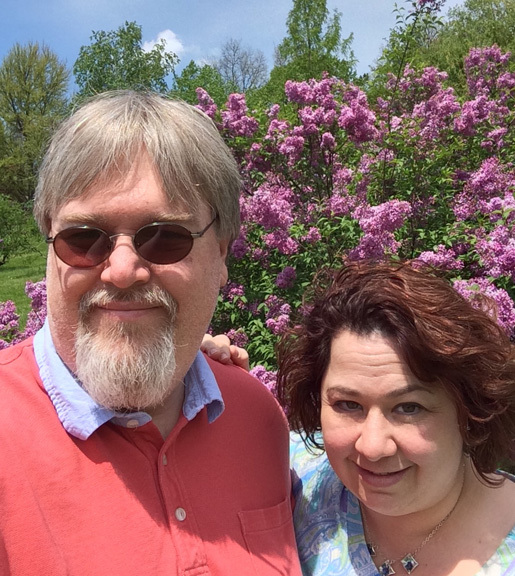 It always fun to spend time with her usually knitting or sewing. She is represented by the Red rings on my block. They surround and support the center block, which is me. I am so lucky to have them in my life. my block! 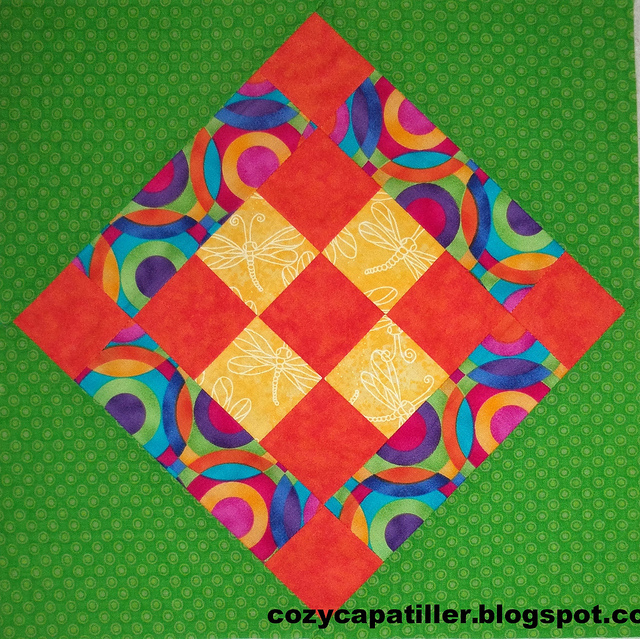 CLICK to my blog for a tip on how I lined up this block’s points .. plus a FUN photo of all my blocks together! Are you on Facebook? I have a new group with the most incredible show and tell going on! You should see it! 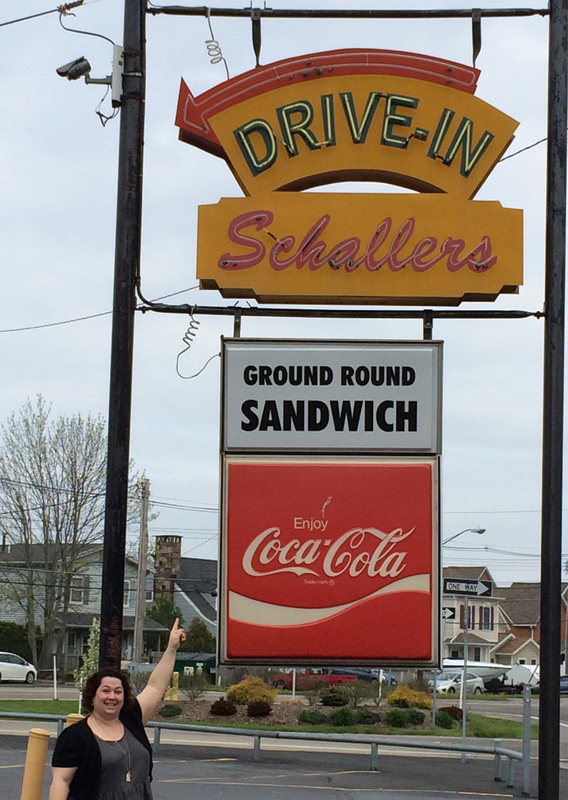 CLICK HERE to join me… I’d love to meet you! The winner this month is Marcia! She did a group photo, love her blocks all together! 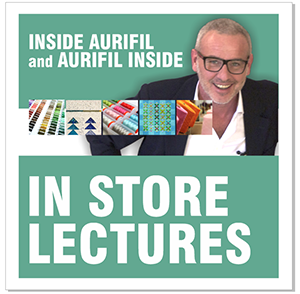 Great interview with another 2014 Designer of the Month. Thank you Pat. Love to read all about other designers. I am so glad you enjoyed the interview Mary Andra! Heidi! Love your block. It was a great story of how it represents you and your sisters. 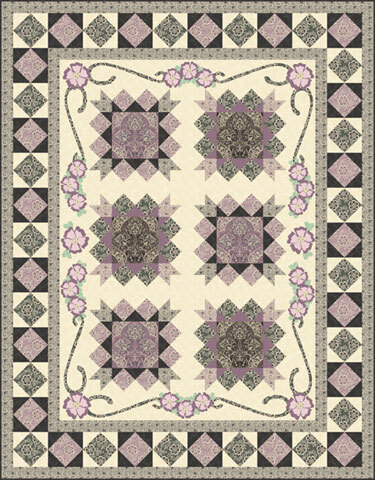 Thank you for the block and the quilt pattern! What a pretty block. Love the feedsack print. 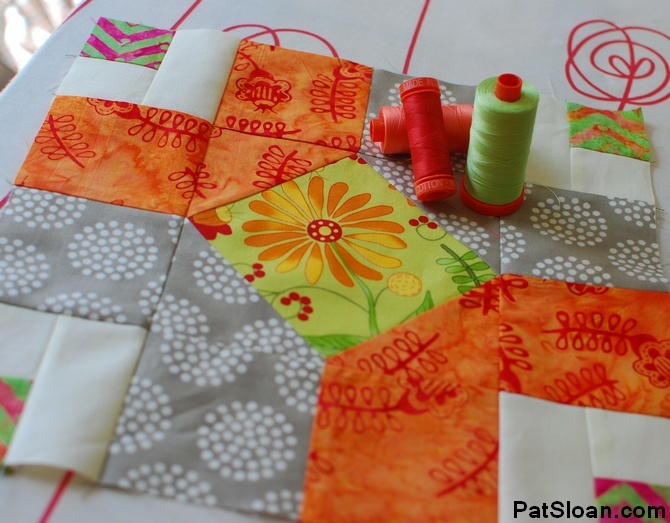 I had a fun time making this block and enjoy seeing how you stow your fabrics on that shelf. Even though space is limited, we certainly know how to fill it! Are you suggesting that my hex2bin is wrong? Cause I’m pretty sure it ain’t.Also “+ 00000010” is not the same thing a bit flipping. Care to explain further?